Amarre, in French, means mooring line: rope, cable or chain by which a boat is attached to the shore or to an anchor. AMARRE aims to connect forcibly displaced artists (or artists in exile) to their host communities. It is a residency programme that provides a safe working space for the selected artists to develop their projects and share them with the local audience, as well as connect them to the professional networks in their new environments. Each local partner will host and accompany the selected artists in exile in the respective countries with the perspective of supporting a culture of openness, free expression and living together. In 2017-2018, AMARRE supported 9 artistic projects. For this second edition, AMARRE takes place in four different countries: Lebanon (Hammana Artist House), Turkey ( A Corner in the World), France (agency of artist in exile) and Belgium (a selection of AMARRE projects will be presented within Moussem Cities Festival). Program designed and directed by Collectif Kahraba / Hammana Artist House | In partnership with L’Atelier des Artistes en Exil (France), A Corner in the World (Turkey), Moussem (Belgium), | With the support by the French Ministry of Europe & Foreign affairs. Artists of Syrian origins working in the fields of performing arts and music, currently in exile in France, Turkey or Lebanon. Candidates must be available to work on an original project that has not already been aired, for a maximum of 15 days between May 15 and May 31, 2019. Each local partner welcomes the selected artists in their respective countries. 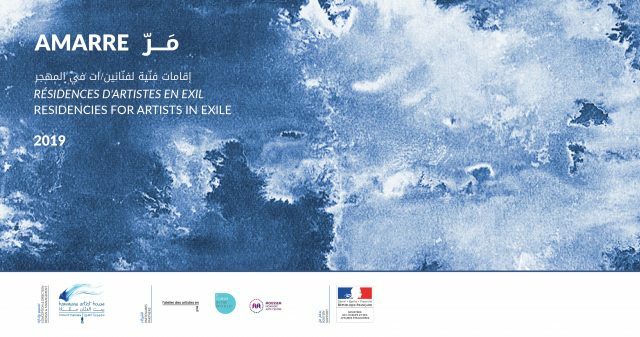 If you are an artist currently living in France, you will be hosted in residency at the Agency of artists in exile, in Paris. For any inquiries, please contact us on: contact@aa-e.org (for France), info@hah-lb.org (for Lebanon), info@acornerintheworld.com (for Turkey) with AMARRE as the subject.